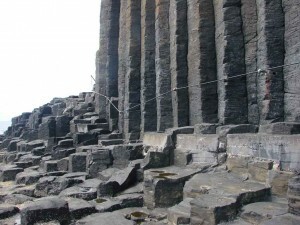 The columns are made of basalt that formed from a molten lava flow over 60 million years ago. 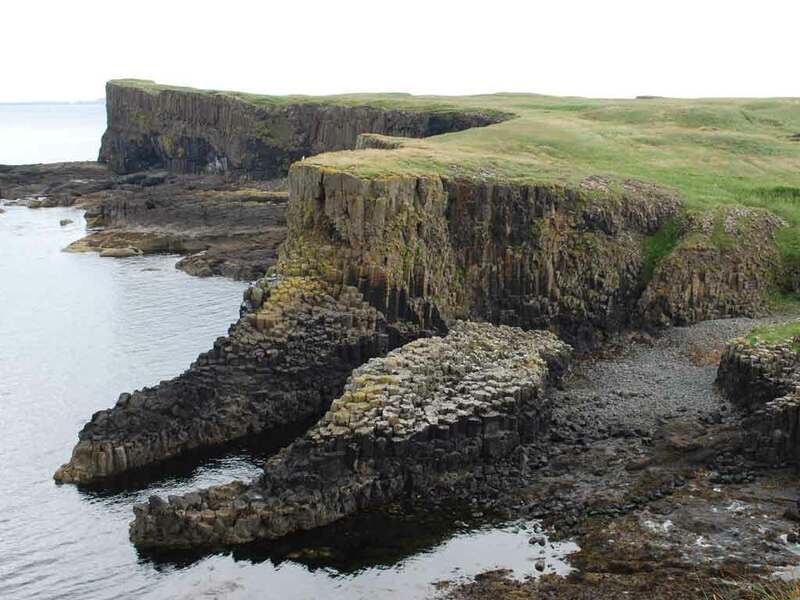 At that time, Scotland and North America were being pulled apart by continental drift to form the north-eastern Atlantic. As the west coast of Scotland was stretched huge amounts of magma rose up through the cracks in the Earth's crust, erupting as lava and volcanic ash onto the surface. 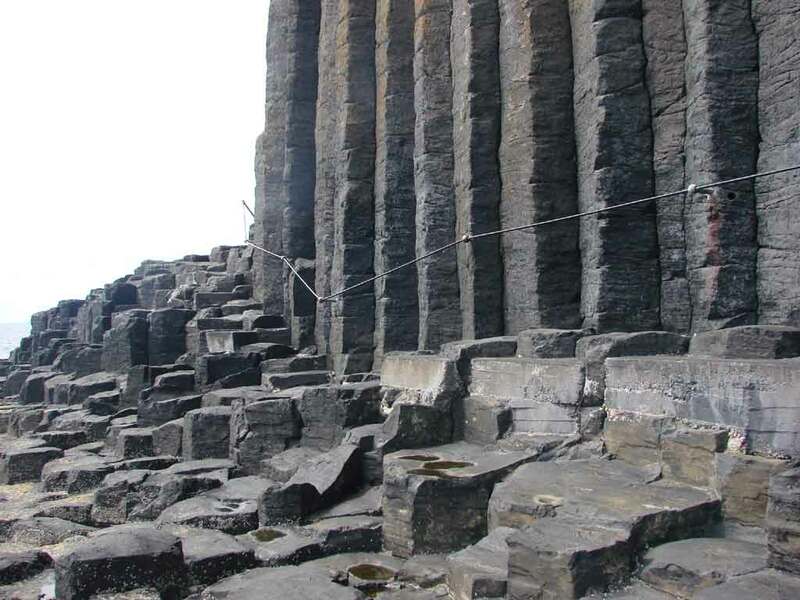 This volcanic activity lasted many hundreds of thousands of years and eventually created a 2.2 km plateau of lava and ash. The island came to prominence in the late 18th century after a visit by Sir Joseph Banks. 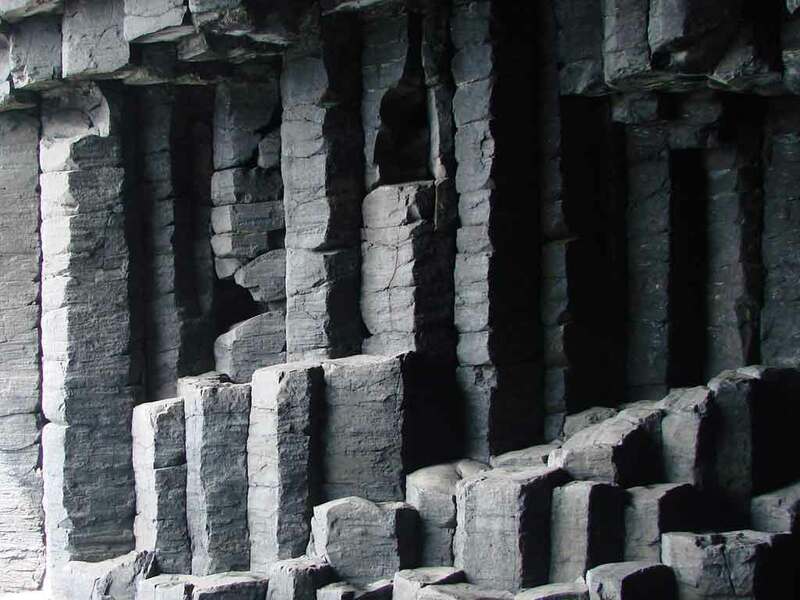 He and his fellow travellers extolled the natural beauty of the basalt columns in general and of the island's main sea cavern which Banks re-named 'Fingal's Cave'. Their visit was followed by that of many other prominent personalities throughout the next two centuries, including Queen Victoria and Felix Mendelssohn. 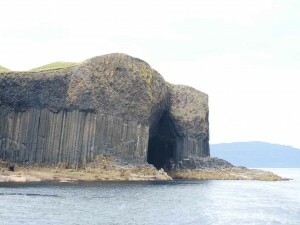 The island became internationally renowned through Felix Mendelssohn's Hebrides Overture (Fingal's Cave). He wrote that the inspiration for this piece of music came from a visit to the island in 1829, while he was standing in the cave listening to the roar of the waves. 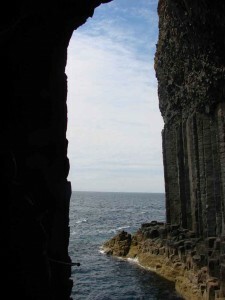 Every year in June, Mendelssohn's music is celebrated with a Mendelssohn on Mull festival. In 1800 there were three Red Deer on the island, later replaced by goats and then a small herd of cattle. Subsequently the summer grazing was used for sheep by crofters from Iona but in 1997 all livestock was removed which has led to a regeneration of the island's vegetation. Puffin, Kittiwakes, Shag and Gulls nest on the island and the surrounding waters provide a food store for numerous seabirds. Underneath the surface there is a rich diversity of creatures. A variety of fish species, including the 2nd largest fish in the world, the Basking Shark, a range of marine mammals from Grey and Common Seals to Minke Whales and Harbour Porpoise. 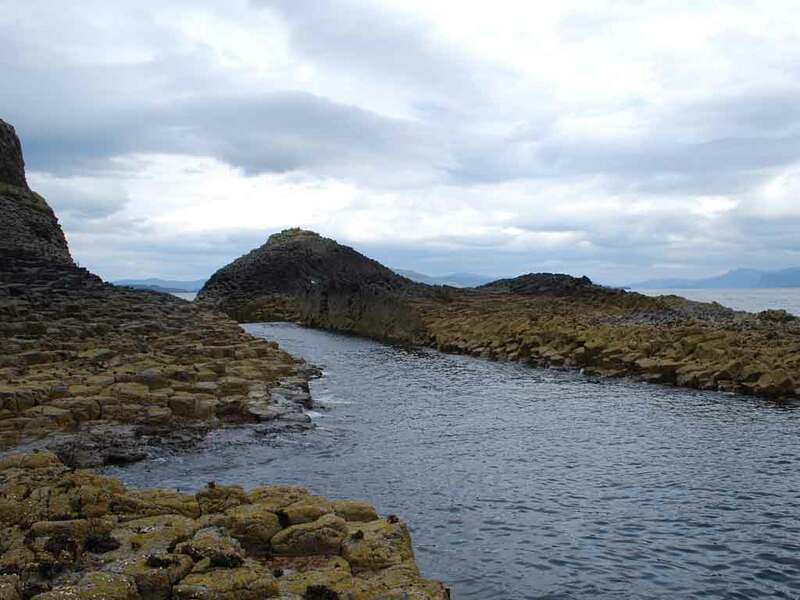 Not forgetting some of the smaller species such as the huge variety of plankton that forms the base of this very important ecosystem, crustaceans and jellyfish. The island is now in the care of the National Trust for Scotland. If you are staying anywhere in reach of Tobermory, we recommend that you book through the Information Centre in Tobermory (01688 302875). Refunds and general information is at hand including probabilities of sailings etc. Through the individual companies' websites it can take longer.